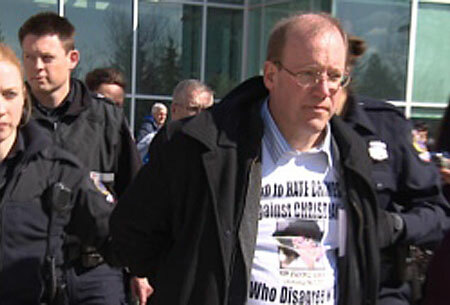 REGINA, Saskatchewan — Peter LaBarbera, the leader of the anti-gay hate group Americans for Truth about Homosexuality (AFTAH), was arrested Monday at the University of Regina for violating a no trespass instruction given by campus security officials. LaBarbera and Bill Whatcott, a Canadian anti-abortion activist, were taken into custody and charged with mischief, reports the CBC. LaBarbera and Whatcott were in Weyburn over the weekend to speak at a pro-life conference. They were at the school attempting to hand out anti-abortion and anti-gay pamphlets, flanked by large placards depicting aborted fetuses. LaBarbera was briefly detained at the Regina airport last week, but was allowed into Saskatchewan to participate in an anti-abortion conference in Weyburn on the weekend. LaBarbera’s group has been designated as an anti-gay hate group by the Southern Poverty Law Center.